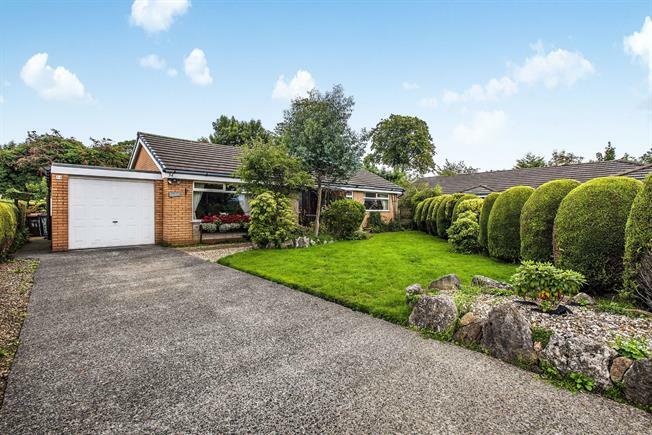 3 Bedroom Detached Bungalow For Sale in Preston for Asking Price £230,000. NO CHAIN Due to a strong demand; We are pleased to offer for sale this attractive three bedroom detached true bungalow positioned on a larger than average plot, anticipated to bring strong interest and attract a wide range of aspiring home buyers. As you enter this home, you are welcomed into a spacious imposing entrance hallway with glazed door welcoming you into a bright 'L' shaped living space. The generously proportioned living room has a feature large window to the front elevation and exposed brick surround with gas fire. Adjoining the lounge is a beautiful dining area which has a sliding patio door onto the garden. The fitted kitchen has a host of integrated appliances along with a wonderful glass conservatory overlooking the garden, ideal for summer and enjoying the peaceful wildlife. Continuing down the hallway, there are three generously proportioned bedrooms, the master bedroom benefitting from a range of fitted furniture and a four piece bathroom suite. Externally, off road parking facilities are provided which also gives access to a brick built large single garage with electric door. The surrounding gardens are private and mature being positioned in a corner plot at the end of the cul-de-sac and are very low maintenance. View to appreciate..
UPVC double glazed entrance door. Radiator, carpeted flooring, built-in storage cupboard. UPVC sliding double glazed door, opening onto the garden. Radiator, carpeted flooring. Hardwood single glazed door. Double glazed uPVC window facing the rear. Radiator, vinyl flooring, tiled splashbacks. Roll top work surface, fitted wall and base units, stainless steel one and a half bowl sink with drainer, integrated, electric, double oven, gas hob, space for dishwasher, space for washing machine, fridge. UPVC sliding double glazed door, opening onto the garden. Laminate flooring. Double glazed uPVC window facing the rear. Radiator, vinyl flooring, tiled walls. Low level WC, jacuzzi, walk-in shower, pedestal sink. Electric up and over door. Power sockets and lighting. Double glazed uPVC rear entrance door via the garden. Double glazed uPVC window facing the side.